The design of components subjected to contact, i.e. local compressive stress, is extremely important in such engineering applications as bearings, gears, railway wheels and rails, cams, pin-jointed.links, etc. Whilst in most other types of stress calculation it is usual to neglect local deflection at the loading point when deriving equations for stress distribution in general bodies, in contact situations, e.g. the case of a circular wheel on a flat rail, such an assumption would lead to infinite values of compressive stress (load -=- "zero" area = infinity). This can only be avoided by local deflection, even yielding, of the material under the load to increase the bearing area and reduce the value of the compressive stress to some finite value. Yield has been shown to initiate sub-surface when the contact stress approaches 1.2 cry (oy being the yield stress of the contacting materials) with so-called "uncontained plastic flow" commencing when the stress reaches 2.8 ay. Only at this point will material "escape" at the sides of the contact region. The ratio of loads to produce these two states is of the order of 350 although tangential (sliding) forces will reduce this figure significantly. Unloading from any point between these two states produces a thin layer of residual tension at the surface and a sub-surface region of residual compression parallel to the surface. The residual stresses set up during an initial pass or passes of load can inhibit plastic flow in subsequent passes and a so-called "shakedown" situation is reached where additional plastic flow is totally prevented. Maximum contact pressure for shakedown is given by Johnson'14' as 1.6 gy. Pure rolling of parallel cylinders has been considered by Radzimovsky<5) whilst the effect of tangential shear loading has been studied by Deresiewicz"5', Johnson"6', Lubkin"7', Mindlin"8', Tomlinson<l9) and Smith and Liu(20). (c) Thermal stresses and associated material property changes resulting from the heat set up by sliding friction. (Local temperatures can rise to some 500°F above ambient). Fig. 10.1. 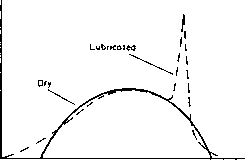 Comparison of pressure distributions under dry and lubricated contact conditions. Scott(26). One important conclusion drawn by Dowson et al. is that at high load and not excessive speeds hydrodynamic pressure distribution can be taken to be basically Hertzian except for a high spike at the exit side. In discussion of the effect of residually stressed layers on contact conditions, Sherratt'27' notes that whilst the magnitude of the residual stress is clearly important, the depth of the residually stressed layer is probably even more significant and the biaxiality of the residual stress pattern also has a pronounced effect. Considerable dispute exists even today about the origin of contact stress failures, particularly of surface hardened gearing, and the aspect is discussed further in §10.1.6 on gear contact stresses. Muro(28), in X-ray studies of the residual stresses present in hardened steels due to rolling contact, identified a compressive residual stress peak at a depth corresponding to the depth of the maximum shear stress - a value related directly to the applied load. He therefore concluded that residual stress measurement could form a useful load-monitoring tool in the analysis of bearing failures. (i) Contact of two parallel cylinders - principally because of its application to roller bearings and similar components. Here the Hertzian contact area tends towards a long narrow rectangle and complete solutions of the stress distribution are available from Belajef12', Foppl'3', M'Ewen'4' and Radzimovsky'51. (ii) Spur and helical gears - Buckingham*6' shows that the above case of contacting parallel cylinders can be used to fair accuracy for the contact of spur gears and whilst Walker'7' and Wellaver<8) show that helical gears are more accurately represented by contacting conical frustra, the parallel cylinder case is again fairly representative. 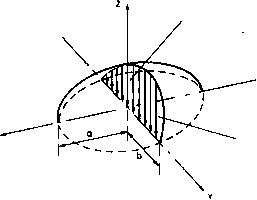 (iii) Circular contact - as arising in the case of contacting spheres or crossed cylinders. Full solutions are available by Foppl'3', Huber(9) Morton and Close(10) and Thomas and Hoersch(11). (iv) General elliptical contact. Work on this more general case has been extensive and complete solutions exist for certain selected axes, e.g. the axes of the normal load. Authors include Belajef*2*, Fessler and 011erton(12), Thomas and Heorsch"" and OHerton(13). In his study of this general contact loading case, assuming elastic and isotropic material behaviour, Hertz showed that the intensity of pressure between the contacting surfaces could be represented by the elliptical (or, rather, semi-ellipsoid) construction shown in Fig. 10.2. Fig. 10.2. Hertizian representation of pressure distribution between two curved bodies in contact. where a and b are the major and minor semi-axes, respectively.